Maggie L. Walker Governor’s School “We the People” team is coached by social studies teacher and alumnus Sam Ulmschneider (class of ’02). 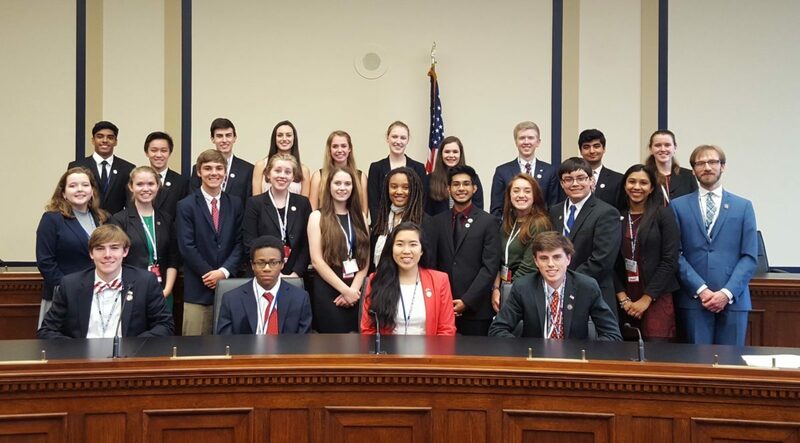 The Maggie L. Walker Governor’s School “We the People” team placed first in the nation in The Citizen and the Constitution National Finals, held at the National Conference Center in the Washington D.C. area, April 21 through 24, 2017. The team of twenty-four seniors, coached by Sam Ulmschneider, claimed the regional championship title in a competition at Glen Allen Cultural Arts Center in 2016. Earlier this year, the team won the state championship, which was hosted by University of Virginia. This win marks the third national championship for MLWGS in the 30-year history of this competition. Richmond-area Douglas S. Freeman High School placed sixth in the academic competition, giving the Commonwealth two top-ten teams. Nearly 1,300 high school students from forty-two states gathered in Washington, D.C., to participate in the thirtieth annual We the People National Finals, administered by the Center for Civic Education. The initial field of fiffty-six classes was reduced to ten finalists based on the combined scores of each class over the first two days of intense examination of their constitutional knowledge. During the competition, students demonstrate their knowledge of constitutional issues before simulated congressional committees composed of constitutional scholars, lawyers, historians and public officials. During the school year, students complete a comprehensive course of study on the Constitution to qualify for the competition. ABOUT MAGGIE L. WALKER GOVERNOR’S SCHOOL The Maggie L. Walker Governor’s School for Government and International Studies is a highly-selective, regional public school that serves students throughout the metropolitan Richmond area. The participating school divisions are Charles City, Chesterfield, Goochland, Hanover, Henrico, Hopewell, King and Queen, New Kent, Petersburg, Powhatan, Prince George, and Richmond.